After extensive medical and psychological testing over many months, Rosemary Frei, a Canadian citizen, parted with one of her kidneys to help somebody she did not know. Donating a kidney is one way to lose weight quickly, albeit a paltry five ounces. Last fall, I donated my left kidney anonymously at a hospital in southwestern Ontario. I was one of five non-directed donors in a group of 31 kidney donations made through the Canadian Blood Services’ Living Donor Paired Exchange (LDPE) registry. In addition, I was the first person to anonymously donate a kidney in the city where I gave my kidney, and also was part of the hospital’s first-ever participation in the LDPE. I hope my organ winds up in a good home. I only know that the recipient is doing well. I’ll never know anything more, not even the recipient’s age or gender. I do have an unsigned card and small gift from the recipient’s family, plus a letter of thanks and a medal from the hospital where my kidney and I parted company. It wasn’t fun recovering from the nephrectomy, but I’m confident that I’ll live a long and healthy life, with my right kidney fully shouldering the job it once shared with its contralateral partner. It started six years ago, when I nearly donated a kidney to a woman I barely knew. This acquaintance had told me in my backyard over tea one summer day that she suffers from chronic kidney disease and would eventually need a kidney transplant. I spontaneously said I’d be happy to be tested for compatibility, and immediately started the process through the Toronto General Hospital (TGH), one of the local transplant centers. I dutifully completed the blood and urine testing, as well as the stress echo, electrocardiogram (ECG), chest X-ray and abdominal ultrasound. Then, a surgeon I knew in Los Angeles talked me out of going any further. I was in regular contact with him for work, and mentioned to him I was going to donate a kidney. He said that unless I could answer “yes” to the question, “Would you give your life for this person?” I shouldn’t donate. So I called the transplant program and said I was not going to proceed. I figured that surely a surgeon knew best. Understandably, the woman I had intended to donate to was upset. Several years went by and I heard about the results of a study of long-term follow-up of kidney donors (N Engl J Med. 2009;360:459-469). 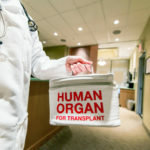 Most donors in the analysis had quality of life scores that were higher than those of the general population, and the prevalence of kidney failure, hypertension, and albuminuria in the donors was similar to that of controls. Those were very compelling results. Clearly, there’s very little that’s life-threatening about giving a kidney. In October 2009, I contracted stomach flu while I was traveling on business. In the wee hours of the morning, when I was at the absolute mercy of the bug, I evaluated what my regrets would be if I should die. It occurred to me that a major one would be not having donated a kidney. After all, I’m fit and usually very healthy, and am well-informed about the risks and benefits of donating a kidney. Then, I listened online to a lecture I’d heard about by a woman named Lori Palatnik. The lecture, entitled “Why I Gave a Kidney to a Stranger,” was very inspiring. I was 100% ready to move forward. On November 9, I received a package in the mail from the TGH containing an 11-page description of the risks and benefits of live kidney donation, of the assessment of the donor, and of the surgery itself and the follow-up. There was also a six-page questionnaire on my health history, as well as a brochure outlining a program for reimbursing donation-related expenses from the Trillium Gift of Life Network. It is supported by funds accrued by the province of Ontario from lotteries. I felt both happiness that the process was beginning and trepidation at the prospect of going forward. I completed the questionnaire and faxed it back to the Living Donor Program office. The staff reviewed it and informed me that I could proceed with testing. On Tuesday, Dec. 8, and Wednesday, Dec. 9, I completed the 24-hour urine test and gave a blood sample for a complete blood count. Five weeks later, on Tuesday, Jan. 12, I heard back from the program that a nephrologist, Robert Richardson, MD, had reviewed my test results and there were no red flags. So it was on to the major tests. On Friday, Feb. 5, I underwent stress echocardiography, a computed tomography scan, and chest X-ray. On Monday, Feb. 8, I underwent an abdominal ultrasound, met with Michael Garrels, RN, who is the Kidney Transplant Assessment Coordinator at TGH, and met with a surgical psychiatrist. On Thursday, Feb. 11, I met with a social worker and had two glomerular filtration rate (GFR) tests. The meeting I’d been most anxious about was the one with the surgical psychiatrist. I’d worried she might uncover some deep, dark pathology that would bar me from being a donor. Fortunately, the appointment went well: She sized me up very quickly and we spent a lot of time in of our hour-long session chatting about her daughter’s academic career overseas. I was told by each professional I met with about the risks associated with the surgery, the most major being a 0.03% probability of perioperative mortality. Studies also show a small increase in blood pressure may occur in the decades after donation, but there’s plenty of excellent medications to combat that problem if it arises. Garrels told me about the LDPE registry. If I agreed to join it, I’d participate essentially in a “domino” set of people. There are four rounds of matching per year involving people in the registry; there had just been one round on Feb. 1, and the next one would be at the beginning of May. I resolved to join the registry at the earliest opportunity. Two afternoons later I met with Dr. Richardson for 40 minutes. He told me all my test results were very good—I “passed” the stress test with flying colors, my GFR was 95 ml/min/1.73 m2 on the renal scan, my creatinine clearance on 24-hour urine testing was 1.8 mL/sec, my BP is low, my low-density lipoprotein cholesterol is very low, and my high-density lipoprotein cholesterol is very high. Moreover, I’m not on any medications, am lean and in good shape, and had tolerated general anesthesia in two previous orthopedic surgeries. Dr. Richardson said I’m in the lowest 1% of risk categories based on the Framingham scoring system, and that overall he couldn’t imagine a better candidate for donation. He wrote on my chart that he was approving me for donation, with a “Grade A” recommendation. It doesn’t get better than that. Nine days later I got a call from the transplant office asking if I’d consider subbing for someone who was scheduled to donate a kidney the following week but had had some borderline results on the pre-surgery tests. It seemed very quick, but I said yes. I scrambled to put things in place for the possibility of having surgery the following Wednesday. First thing Monday morning, I went to the hospital for the pre-surgery blood tests, including a fresh-blood cross-matching, and another ECG. Garrels called me at about 4 p.m. to say that hey were going with the original person. That was a relief but also a let-down, because if the donation had gone ahead I would be able to get it over with that much sooner. I formally joined the LDPE registry on April 19. On May 13, Garrels called me to give me the results of the round of matching that had taken place at the beginning of May. I’d been slotted into a chain of nine pairs of donors and recipients. I’d be donating to someone in a hospital elsewhere in Ontario, and the surgery would occur in July or August. However, over the ensuing months, those pairs were reduced to five, and the donations did not occur simultaneously. Clearly, national matching is tricky and complicated. I found out later from an official at the LDPE that there had been a total of 83 pairs of donors and recipients in the round of matching in which I participated. I was one of five non-directed donors (see sidebar for the latest LDPE stats). I also soon found out the hospital where I was donating had neither accepted an anonymous donor before nor participated in the LDPE. So I was a two-fold guinea pig. The hospital where I’d be undergoing nephrectomy requested additional testing, so on May 26, I went back to TGH to give another fresh blood sample for cross-matching, and on Monday, June 7, I had a glucose tolerance test. A few months later, I received an e-mail from Garrels informing me of the surgery date and saying that final testing would occur in the week or two before that. My final set of testing and appointments took place a couple of weeks before the surgery. I quickly spread the news to my parents, my partner, and my other close family and friends. I wasn’t nervous at all. Rather, since I had been waiting for months, I was excited and eager to get this all done. My final set of testing and appointments took place took place a couple of weeks before the surgery. On the afternoon of September 9, I drove to the city where the testing and surgery would take place. The next morning I received my blue hospital card. First up was giving 19 vials of blood for the preop tests for everything from various infections (AIDS, hepatitis, West Nile virus, etc. ), to electrolytes and liver enzymes. Next, I had an hour-and-a-half meeting with a Renal Transplant Program social worker. Her two main concerns were that I was sure I knew what I was doing and that the anonymity of my donation would not be breached. I met with the nephrologist who was in charge of my donation as well as one of the nurse case managers for living donors. The woman who was my ‘mentor’—a woman I had been paired up with through the Ontario Chapter of The Kidney Foundation of Canada who had anonymously donated a kidney five years earlier, and who happened to live in the city where I’d be donating my kidney—told me later that it was this nephrologist who had not allowed her to donate a kidney anonymously in London (so she donated at the TGH instead). He had changed his mind, after watching the examples of other centers such as TGH that have accepted non-directed donors for years, that the hospital would accept non-directed donors, starting with me. They were both highly professional and personable. The nurse performed a quick physical check-up and also asked me to complete a questionnaire to help verify that my donation would be safe both for me and the recipient. The nephrologist came into the examining room and stayed for a few minutes. He asked if I had any questions about the donation or the anonymity of it, the sequelae, follow-up, and so forth. After all of these appointments, I felt fully informed about what is involved in kidney donation and the nature of the perioperative and long-term risks. I went whitewater canoeing over the weekend and the following Tuesday I drove with a friend for the last set of appointments. First up was a meeting to sign up for the living-kidney-donor study. Then I met again with one of the nurse case managers who answered my final questions about the surgery. After lunch, I went to the offices of the urologist who would be performing my surgery. A urology fellow first went over a brief questionnaire about my previous surgeries and urology history, and then I met with the urologist for about 15 minutes. I asked how many living-donor nephrectomies he had performed, and he said had had performed 200. About a week later one of the nurse case managers e-mailed me two lab requisitions. I immediately went to a local lab. I found out a couple of days later that the tests revealed my urine was clear and that my previously slightly elevated bilirubin was down. So, at last, everything was set. I started a liquid-only diet 24 hours before surgery, and my parents and I drove to the city where the surgery was to take place. To ensure anonymity, the transplant team had decided I should be admitted to the hospital that afternoon rather than the next morning, which was when the surgery was scheduled. Over the course of six hours I was admitted, given a bed on a general-surgery ward, had a quick meeting with a nurse, received another chest X-ray and ECG, and been greeted briefly by a nurse case manager. I also met with a urology fellow who asked me to sign a consent form for the use of blood products if the surgeon deemed it necessary and for the laparoscopic nephrectomy itself. I finally was allowed to leave the hospital overnight on a leave of absence. I’d spent so much time waiting that I’d finished my book, “The Girl with the Dragon Tattoo.” Fortunately, I wouldn’t need more reading material for the rest of my stay in the hospital: Right after a nephrectomy is not an optimal time for reading. After spending the night at a nearby hotel, my partner drove me to the hospital at 6:15 a.m. and we went up to my hospital room. I was tired but very calm. Two nurses took blood for redoing the cross-match and put in an IV access and started a saline drip. A couple of medical students dropped in to say hello, and the urology fellow came back and initialed my left flank to indicate the designated surgery site. At 8:30, a porter came to take me down to the OR. My girlfriend and my parents came with me. We were in a holding area for about 15 minutes, during which an anesthesiology resident came by and confirmed that I was fit for the surgery, and the attending anesthesiologist also said hello. I said goodbye to and kissed my partner and my parents and was whisked into the operating room. The urologist greeted me at the doorway. An anesthesiology resident and another health care worker moved me from the gurney to the operating table. The resident gave me an injection “to help me relax”, even though I was perfectly calm, comfortable, and collected. That’s all I remember until I woke up in the recovery room just after 1 p.m. Apparently the injection had been midazolam, which has an amnesiac effect in most patients. In the recovery room I felt giddy and great. About half an hour later, I was brought back up to my bed, where I was greeted by my partner and parents. I quickly called a sister in Toronto, who in turn spread the word via email to family and close friends that I’d come through the surgery in fine form. It didn’t take long for the anesthesia to fully drain from my system, and I went into much lower gear. I had a restless night. It’s not easy to sleep with sick neighbors, with leg stockings that keep inflating and deflating every few seconds to reduce the probability of emboli, and with nurses regularly checking your vital signs. Nonetheless, I felt pretty good and asked if I could be discharged that day. No such luck: I was told I couldn’t be discharged until I passed gas. Being a person who likes to work hard toward goals, I pushed myself out of bed in the morning, and managed a walk to the end of the ward hallway and back. But I felt weak so I dropped right back into bed. In the early afternoon, my mom took me for a walk “around the block,” that is, a full circuit around the ward. Later that afternoon, I did the circuit seven times by myself. I was rewarded by my first flatulence in the late afternoon. At some point during the day (I was keeping a handwritten diary in the hospital, but it wasn’t exact) the surgeon came by and confirmed I was doing very, very well and would likely be discharged the next day. That evening a resident officially signed the order for my IV drip to be stopped. I also received two Therapeutic Touch treatments during my hospital stay from a nurse trained in this healing art—this is available to patients in most major hospitals upon request. I took one last, short, walk in the early evening before supper, then went to sleep at about 9 p.m.
First thing the next morning a nurse checked my vital signs and found all was well. He also took a couple of vials of blood for a complete blood count. I did five more “laps” around the ward. Two residents came by at about 7:45 a.m. and said I could be discharged that morning. Just before I left the hospital, the social worker came to see me. She said that what I’d done was “beautiful.” She gave me a card (unsigned, of course) from the recipient’s family as well as a small gift—a tile with the words ‘Every charitable act is a stepping stone towards heaven—Henry Ward Beecher’ inscribed on it. When I got home I put the tile in my living room, where I can look at it every day. There were times while I was in the acute recovery phase that I questioned my sanity for having allowed a surgeon to yank out an organ for absolutely no benefit to me. But three weeks post-nephrectomy I received confirmation from a urologist at TGH that I was recovering very well. I was fully back to normal a week later. I have no regrets, only only a permanent ego boost from knowing I prolonged someone’s life without shortening my own.